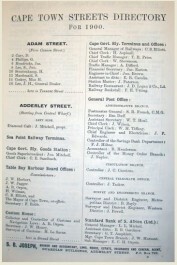 This directory is crammed with the names of people, their residences, occupations and their businesses. It covers Cape Town and environs, including Woodstock to Wynberg, Plumstead to Fish Hoek, Sea Point, Green Point, Mouille Point and Simonstown. The great thing about this directory is that it has an alphabetical street directory as well as an alphabetical residents’ directory so that it is possible to look up who lived near to your ancestors. A separate Trades and Professions directory is arranged by type of business and gives names and addresses. Well worth adding to your collection.